The strategic location on one of the longest beaches in the world makes the Radisson White Sands Resort, Goa one of the favorite among the visitors. 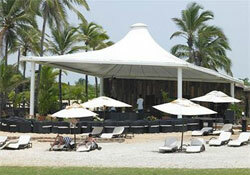 The Radisson White Sands Resort offers one of the best stays in the exciting state of Goa. The hotel takes the guests close to the fun and enjoyment of sea making the time spent at the hotel more enjoyable. The beautiful hotel on the sea shores offers exquisitely designed and well maintained 158 rooms out of which 4 are suites. The rooms are spacious enough for a very comfortable stay with the facilities of individual safes, coffee/tea makers, mini-bars and 25-inch flat screen televisions. The hotel also features 4 suites which are filled with the luxuries of Deluxe suite bathroom, Bedroom, Dinning and a Sitting room. Feats on the specialties cooked and served to you with perfection at the Radisson White Sands Resort. One of the best Luxury Hotels in Goa the Radisson White Sands Resort in Goa offers an array of restaurant for a great dining experience. * N.U.T.S - "Never Underestimate The Spirits"
The Radisson White Sands Resort in Goa offers one of the best settings for various meetings and conferences with the well-appointed function spaces which feature executive board room to an elegant ballroom. The business space accommodates up to 450 people. These places are even perfect for banquets and receptions. For relaxation the Radisson White Sands Resort, Goa offers the facilities of a Lotus Spa, the Luxury Ayurveda Spa along with a Ship Shape Gymnasium and 3 Jacuzzis, Saunas and Steam. The sun of excitement never sets in the land of Goa. The life restarts after the sun has traveled down the horizon on the other side. Goa is the dream destination for thousands from all corners of the globe for its impeccable beauty and superb facilities. The long beaches along with the beautiful churches make the trip to the place a perfect one.